Sarah works with visionary entrepreneurs struggling to sell higher ticket packages to super-charge their income and confidence with high end programs that sell the socks off themselves. Be on Your Way to More High-Paying Clients with this High Ticket Pricing Template! Yes! I want High Ticket Yeses! Spend WAY too much time over-thinking what they say + what they do. Have a desire to serve that is BIGGER than their fears. Sarah guides clients to lead from the power of their uniqueness and individuality, claiming their unique gifts and leadership style, so they start getting results - without the cost. 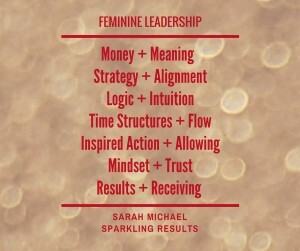 If you are ready to do the INNER + OUTER work of feminine leadership in business + life, let's chat! Sign up here.